Corinne’s family set up two memorial funds to honor her memory and perpetuate her commitment to community service. Both funds are administered by the Community Foundation of Orange and Sullivan Counties. Corinne’s sister, Nicole Feller Lee, founded the Corinne Feller Memorial Fund for Ovarian Cancer Research and Awareness. The mission of this fund is to raise awareness of ovarian cancer, raise funds for ovarian cancer research, and improve the quality of life for cancer patients here in the Hudson Valley. Corinne’s parents, Ronald and Anita Feller, founded the Corinne Feller Scholarship Fund. The mission of this award is to help further the education of a deserving Valley Central graduate. The selected award recipient will have demonstrated outstanding academic achievement, participated in a Varsity sport, provided help for the less fortunate, and shown a concern for the environment. To date $25,000.00 has been awarded in Corinne’s name. The Corinne Feller Memorial Scholarship was the first award to be administrated by the Community Foundation of Orange. 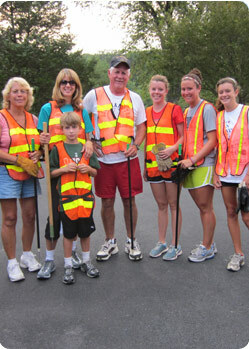 In September of 1999, the group "Friends of Corinne" established the first Town of Montgomery Adopt-a-Highway initiative. Corbett Road is cleaned of trash and debris every season by volunteers. Copyright 2019 © Corinne Feller Memorial, All rights reserved.